Awarded a VISION 2040 Award for The Estelle, recognizing the project’s contributions to affordable housing and healthcare in the region. 2014 SAMHSA-HRSA Center for Integrated Solutions recognizes DESC for innovation and dedication to supporting the whole health of its clients as a SAMHSA Primary & Behavioral Health Care Integration Grantee. 2012 Nonprofit Sector National Achievement Award from National Alliance to End Homelessness given to DESC for its ongoing efforts to end homelessness, particularly among those whose struggle with homelessness is compounded with mental illness and substance abuse. Top 5 Most Influential Research Article from the Robert Wood Johnson Foundation “Health Care and Public Service Use and Costs Before and After Provision of Housing for Chronically Homeless Persons with Severe Alcohol Problems” for 1811 Eastlake. 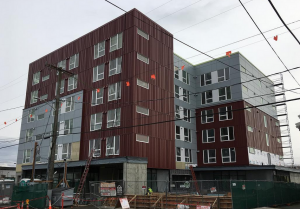 Excellence in Construction Award, “Multi-Family” category from the Associated Builders and Contractors of Western Washington for Rainer House. 2009 Builtsmart Certified Award from Seattle City Light for Rainier House. SeaGreen Certified Award from the City of Seattle for Rainier House. 2008 Home for Every American Award from the U.S. Interagency Council on Homelessness for service innovation for 1811 Eastlake. Maxwell Award for Excellence from Fannie Mae Foundation and the Partnership to End Longterm Homelessness for 1811 Eastlake, a top national honor. Readers’ Choice Awards: Special Needs Housing from the Affordable Housing Finance Magazine for Evans House, the November 2008 issue. Charles L. Edson Tax Credit Excellence Award from the Affordable Housing Tax Credit Coalition for Evans House, Honorable Mention. 2007 Exemplary Program Award for Service Innovation from King County for 1811 EastlakeAnnual Award from the Washington Co-Occurring Disorders Inter-agency Advisory Committee (CODIAC) for 1811 Eastlake. Green Communities Award from Enterprise for Evans House. Builtsmart Certified Award from Seattle City Light for Evans House. BuildGreen certified from the Master Builders Association for Evans House. SeaGreen certified from the City of Seattle for Evans House. 2006 Eagle of Excellence Award Associated Builders Contractors of Western Washington for The Morrison rehabilitation, the top annual honor presented.